After “Huguette The Power” and “Les grasses s’latatent”, it’s time to create a buzz around “Les Mamies Guitares”. From June 29th to July 1st 2018 was held the 9th edition of the “Festival Bruisme”, organized by Jazz in Poitiers, France. It is in this context that the project of “Les Mamies Guitares” was born: to bring on stage seven non musicians aged between 60 to 75 years old. For 5 days, they were able to tame their electric guitars in the company of two musicians, Mathieu Sourisseau and Guillaume Malvoisin, and compose texts to performe on stage: “No individual can be forced, by his granny lable, to sew or make jam. ” The tone is set! Do not miss the chance to listen to “Les Mamies Guitares” in concert! 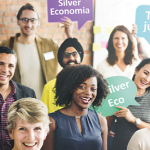 Discover why apply to the Silver Economy and Ageing Well International Awards!